At 26 years old, SuperSport United goalkeeper Ronwen Williams already commands a legendary status at Matsatsantsa a Pitori. But this is not enough – the glovesman from Port Elizabeth is yearning for more. He wants to be the game’s greatest exponent of goalkeeping. Since he made his professional debut late in the 2010/11 season while still a teenager, Williams has clocked more than 250 official top-flight football appearances and he continues to be a key figure in the three-time champions’ line-up. He is the club’s record holder for most appearances. “I am honoured to be the record holder and, at this young age, it spurs me on to achieve more,” Williams told City Press this week. “I can get 500 or 600 games; we don’t see it happening much in South Africa. I believe I can achieve it,” said the goalie who has played in every minute of Matsatsantsa’s official games this season – 17 in all competitions. SuperSport host Mamelodi Sundowns in the Tshwane Derby this afternoon. It is on big occasions such as the epic Absa Premiership clash where Williams wants to be counted. “This is one of the games you look forward to every season. I always want to play the big three [Sundowns, Kaizer Chiefs and Orlando Pirates], and that’s where you get exposure because everyone is watching,” said the former provincial cricket player. Williams said he had outgrown stage fright. Matsatsantsa are chasing an elusive league win over Sundowns since they last won one in March 2013. Wiliams is the only surviving member from that victorious side and he is in a good position to measure their progress since then. “Every team is beatable and we’ve got to believe we can beat them,” said Williams, who was man of the match in SuperSport’s goalless draw against Bloemfontein Celtic in the middle of the week. “The last game we played against them [in the second round of last season] was one of our better games in the past few years. Williams acknowledged the resurgence of his former team-mate Jeremy Brockie, who netted with a trademark volley in Sundowns’ 2-0 win over Leones Vegetarianos in their opening CAF Champions League game in Equatorial Guinea on Wednesday. The New Zealand striker broke his scoring duck with a well-executed volley against Free State Stars in the Absa Premiership early last month. 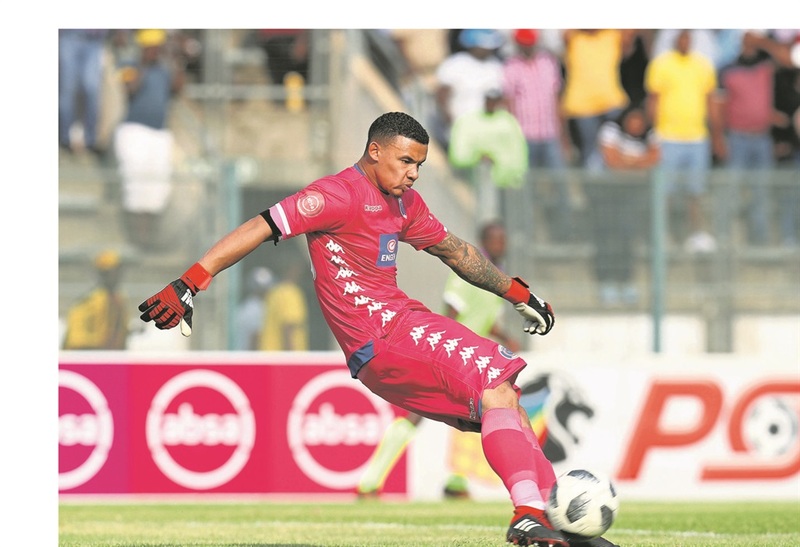 Goalkeepers these days are not seen as the last line of defence, but rather as the starting point of the attack, and Williams shared a few secrets on how to beat Sundowns at their own game. “Their fullbacks will push – be it Lyle Lakay or ­Thapelo Morena – but we have speed on our side. “Those are the spaces we need to exploit and drag their centre backs out,” said Williams, who marked his return from a shoulder injury against Sundowns in their last league meeting. Williams and his coach Kaitano Tembo are hoping not only to lift the monkey off their back, but to end Sundowns’ unbeaten Premiership run that spans 23 games.